How good and crazy does this combination sound? 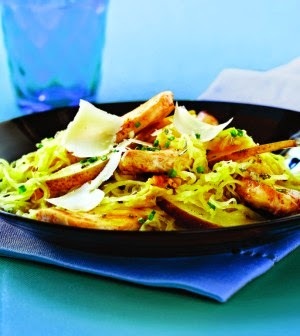 Spaghetti Squash with Chicken, Pears, and Parmesan. Talk about an explosion of flavor. Clean Eating Mag is behind this madness! Preheat oven to 375°F. Place squash cut side up on a foil-lined, rimmed baking sheet. Add 1/4 inch water to sheet. Bake until edges are golden brown and squash is easily pierced with the tip of a sharp knife, about 35 minutes. Set aside until just cool enough to handle. In a large nonstick skillet, heat oil on medium. Add chicken and cook for 2 minutes. Flip chicken and add pear and sage. Sauté, stirring occasionally, until chicken is cooked through, about 5 minutes. Transfer chicken, pears and pan drippings to a large bowl. With 2 forks, scrape stringy squash flesh from skin, separating into strands. Add squash flesh to bowl with chicken mixture. Add chives and toss to combine. To serve, top with cheese. This sounds amazing!!!! I love all the amazing recipes out there with spaghetti squash! !